We get these Groundhogs all the time where we live. They are diggers and if you're not careful, they will dig under your foundation and build a nice home for themselves. My husband and I have had to "Re-Home" a few of them in he past years (Trap -n- Release). What a Handsome Harry. I wonder if this is the guy that was so amorously disposed the other day. HA! 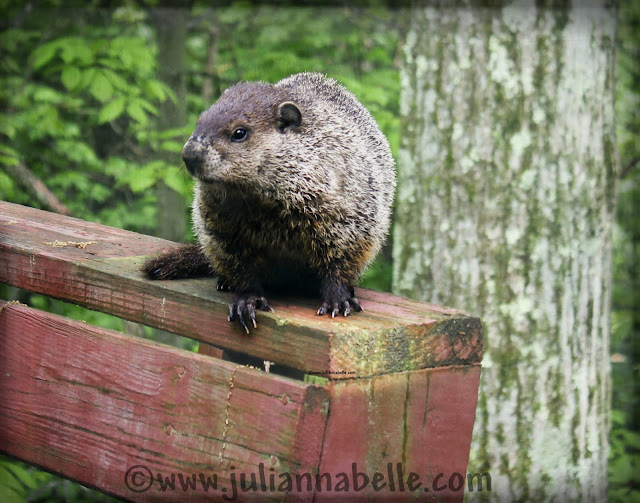 Funny I have pictures of groundhogs on my camera to blog about! but mine are babies! We have a mama that every year has a few babies. This year we caught one and released it. I wish they would go away but they come every year. Yvette Nana - Yeh that was the "same" one!! hahaaaa! Amber - yeh, cute for sure... but go live under someone else's house LOL - thanks for the belated! The groundhog is so cute, though I'm sure you don't think so! Jealous of the rain, we are in a really bad drought in Texas, have had very little rain since Jan or Feb and are already on water restrictions in our neighborhood.